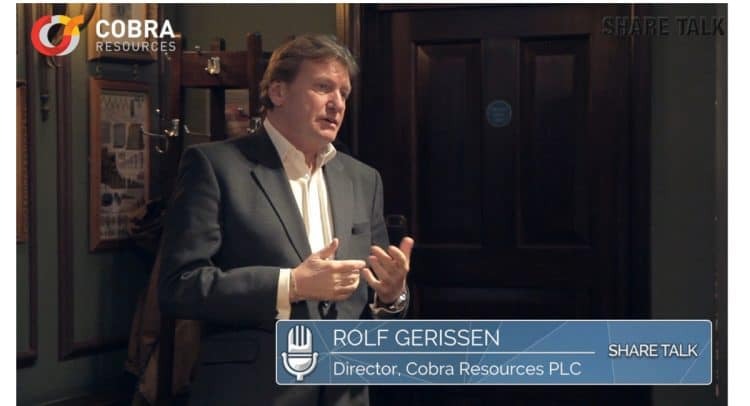 This is the company presentation by Rolf Gerritsen, Director, Non-Executive Director Greg Hancock and Newly appointed director Craig Moulton at Share Talk investor show held on the 29th March 2019 at The Counting House, London, England, UK. The Company will target the acquisition of projects by direct investments or through farm-ins. The investments may be in companies, partnerships, special purpose vehicles, joint ventures or direct interests in mining projects. Target investments will generally be involved in projects that the Company consider attractive opportunities. Such investments may take the form of equity, debt and/or other financial instruments. The Company will be focused on those acquisitions whereby it can have a controlling interest, either by majority share participation or having control of the board and management teams. Cobra will target projects located in, but not exclusive to, Australia and Africa, with a focus on opportunities in selected base and precious metals. In selecting acquisition opportunities, the Board will focus on companies and/or projects that are available at attractive valuations and hold opportunities to unlock embedded value or where there is the prospect of adding considerable value. The Company initially intends to deliver Shareholder returns through capital growth and may, in the medium term, be in a position to distribute income via dividends. Following completion of any acquisition, the objective of the Company will be to operate the acquired business and implement an operating strategy with a view to generating value for its Shareholders through operational improvements as well as potentially through additional complementary acquisitions. Following any initial acquisition and in the event that any subsequent acquisition is deemed a “reverse takeover”, the Company intends to seek re-admission of the enlarged group to listing on the Official List and trading on the London Stock Exchange or admission to another stock exchange dependent upon the nature of the target of the acquisition and the stage of its business.